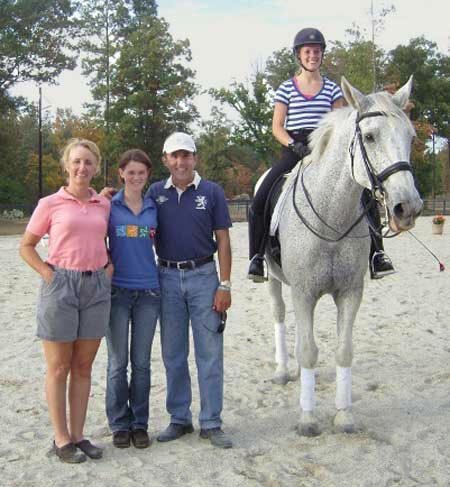 Victory Hill Farm proudly welcomed Dr. Cesar Parra back for a third time, on Nov. 11th and 12th, for a clinic. Dr. Parra has competed at the Olympics, World Championships, and the World Cup Final, as well as at prestigious international shows such as CHIO Aachen. He earned the team silver medal at the Pan American Games and has won more than 300 FEI classes. Dr. Parra has a thriving coaching and training business at his Performance Farm in Whitehouse Station, NJ and Jupiter, FL. His students have earned NAYRC medals, USDF Year End Championships through grand prix, USDF Gold Medals and have qualified for the USEF National Freestyle Championships at grand prix and the USET National Championships. Dr. Parra has studied classical dressage extensively with the world’s best trainers, including Dr. Volker Moritz, Hubertus Schmidt, Herbert Rehbein, Sigfried Peilicke, and Herbert Kuckluck. He has recently become a U.S. citizen and added to his long list of victories with a string of CDI wins, including Devon. Posted in News on November 1, 2009 by danruccia.